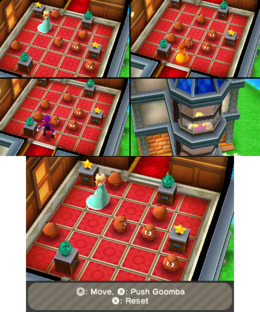 Hotel Goomba is a 4-player minigame found in the game Mario Party 5 and returns in Mario Party: The Top 100. The player walks into the hotel, with several Goombas near the front of the screen. As the player walks in, the mass of Goombas walks away. The screen then splits into four. The main goal of this minigame is to reach the balcony of the third floor of the hotel. In order to do so, the player needs to punch the Goombas out of their way in the three floors. The difficulty level increases as the player goes higher, as more Goombas appear and the puzzles get trickier. When the player punches a Goomba, it moves to the tile directly next to it, depending on the angle at which it is punched. The number of punches increases, as does the probabilities of getting stuck. If the player does get stuck, which means they punched the Goombas incorrectly and cannot move on, they can press to reset the room and try again. 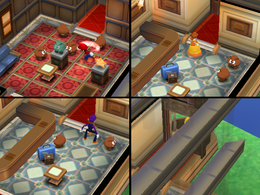 Each room features its own different elements, which generally make the player slow down. The first room is characterized by its simplicity. While the order of the elements found changes at random each time the minigame is started, there will always be some luggage left on the floor, a counter, a plant and a table. The walls are very plain, although they are decorated with paintings that have nothing on them except a frame. The floor is basically a lot of tiles (5x5 to be exact). Each object occupies exactly one tile of space. The first room usually contains no more than two Goombas, which are very easily punched out of the way. As the player continues their way, they will step on a red carpet and proceed to take an elevator to the next floor. The second floor's room is quite similar to the first, but gives a more relaxing atmosphere. The tiles are still 5x5, but this time, they are brown-colored, giving a wooden feeling to the room. The background elements completely change this time. There are tables with white table cloth on them, and usually have food or flower pots on them. These tables occupy more than a single tile. There's also usually a piano, which takes a total of four tiles (2x2). The walls are a bit darker than the last room, and instead of paintings, they have windows. There may also be green seats scattered through the room. The Goombas here, again, are very easily punched out of the way and usually are no more than three. As the player proceeds, they will once again step on a red carpet and automatically run to an elevator. The last floor is the most complicated one, and may lead the player to several errors. There are usually a large number of Goombas in it, going from 5 to even 10. Unlike the other rooms, the walls are much more detailed in this one, taking a dark brown tone this time. There's also a single window on the left wall, in the exact same location as the last one. The tiles here are red, with a circle on the middle of them. Background elements here are more pertaining to a living room: Sofas, tables and small tables with nothing on them. There may also be statues of Goombas. The screen showing the winner zooms in as they enter a door. It then shows the winner walking out onto a balcony, followed by them turning around and performing their victory animation. Rules – "Reach the third balcony of the hotel by punching the Goombas out of your way. Whoever reaches the third balcony first wins." Advice – "If you move the Goombas in the wrong order, you can get stuck. Press to reset the room, and then try again." Description – "Move the Goombas blocking your way through 3 rooms of the hotel!" On-screen – "Move Goomba to reach the exit!" This page was last edited on December 28, 2017, at 07:38.